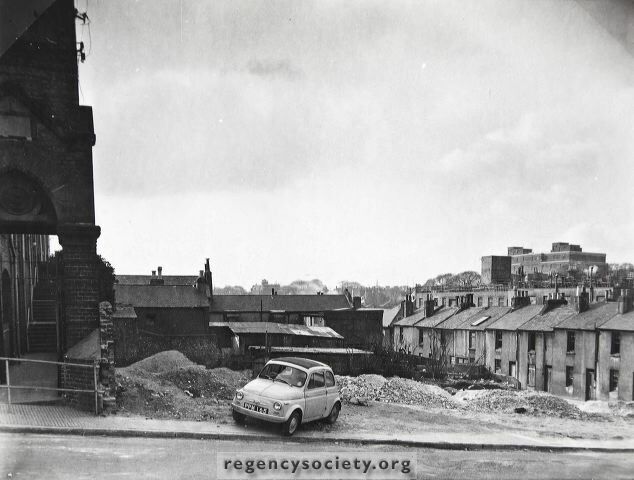 Looking across Richmond Street to the houses of Ivory Place, then awaiting demolition in 1960. I will always remember the day the School Clinic in Ivory Place was bombed very well. At the time, in March 1943, I was nearly seven years old and lived at number 38 Milner Flats, which was right opposite Ivory Place, with my Mum and Dad and my brothers and sisters, Patsy, George, Mary, Jeannie and Tony. I was the baby of the family then, although I later had two more brothers, Michael and Paul. On the day of the bombing, I was not in school as I’d just had my tonsils out. I was in my Mum’s bedroom, playing on her big brass bed, when I suddenly heard a very loud whooshing noise and saw the whole frame of the window facing the Clinic coming towards me. At the same time I was lifted up and thrown against the back wall of the room. I slipped down amongst the rubble and the bedroom door caved in and almost covered me. Although I could not move, my face was not covered and I lay there for what seemed like ages. I could hear my mother calling me. Eventually, I felt the door and rubble being moved off me and I was gently lifted out by an ARP warden. My mother told me later that he had seen my fingers poking out from the debris. I remember my mother tipping water down my face and rubbing her hand over it to clean me up. The next morning we passed the ruins of the Clinic on the way to the butcher’s shop. I remember seeing a big concrete stone, probably the dedication stone, which had been positioned in the wall above the big double doors at the front of the building; it was just lying amongst all the rubble. As we walked along I picked up a coin from the ground; I think it was a sixpenny piece – I seem to remember it had a sort of gate pattern on the back. My mother looked at it and said I should cherish it as it had probably belonged to one of the nurses at the Clinic. The events of that day are still very vivid in my memory. This is a story that was told to me by my grandparents. My mother was attending this clinic just after I was born in 1942, if you had known my mother you would have spotted her stubborn streak. First she was told I was putting on too much weight, then not enough, so with this in no uncertain terms she told them what to do with the clinic. Here is the punchline – she had an appointment on the same day that the clinic was bombed, this was a lucky escape.